In her debut piece for The Armenite, Karmun Khoo has just signed up to learn the Armenian language. This is the story of her journey. “I’m learning Armenian,” I tell my mother. “Is that in India?” she asks. I’m not surprised. Whenever I tell anyone I’m taking Armenian language courses online, they react with a mixture of puzzlement and interest. Because it’s a beautiful language, I wanted to tell her. Because it is lovely, and thousands of years old, and it will die if we do not keep it alive. But I felt I didn’t have the right to lecture her about Armenian culture. After all, I’m just a 16-year-old girl from Singapore living in Australia. Why would I need to learn Armenian, a language that’s only known by about six million people worldwide? My friends are right. I must be crazy. Still, I had already signed up for a spring term at the Armenian Virtual College, hosted by the Armenian General Benevolent Union (AGBU.) The process was easy enough: fill in a form, choose a few courses, and pay $199. The administrator I email for help tells me the money will be refunded if I get straight A’s. Cash back for good grades? I accept the challenge. The instructors all have exotic last names like Khatchaturian and Petrosian. I wonder what my name would look like in Armenian, which, to me, resembles a sequence of scribbled glyphs. My course instructors waste no time contacting me. Bari galust, they say. Welcome. I have had experience with online courses before, having taught myself Catalan in the past, but my tutors have never been this welcoming. “Armenians have a dark past,” Marina tells me. She is the course instructor for AL 102: “Beginner’s Eastern Armenian” and she will be guiding me through my entire AVC journey. I know what she is referring to – the 1915 Armenian Genocide, the Medz Yeghern, the Great Crime. 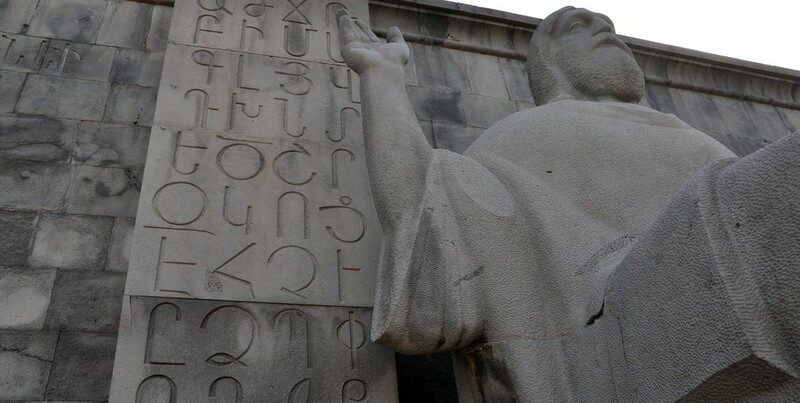 It is this tragic event that led to the mass migration of a generation of Armenians, who brought their language with them to different countries and created countless diasporas around the world. It is this language, heavy with dark history, that I will now attempt to learn. I also sign up for AH 222: “Armenian History Part One.” On another curious whim, I sign up for CP 422: “Basic Chess Strategy”; Armenians have always dominated the international chess scene and now I will find out why. My fellow classmates have started to introduce themselves in the forums. There is an elderly schoolteacher from New York, a Syrian dentist surrounded by falling bombs, and a globetrotting debutante catching up on her mother’s native tongue between intercontinental flights. “I am Karmun, and I’m from Australia,” I write. “I hope that we will learn well together.” There are no replies. In the downloadable folder that reads “Week 1,” I find some interactive lessons on the rudimentary alphabet. A recorded voice guides me through the entire set of lessons. I jot down notes in my notebook, making sure to acknowledge both the cursive and printed letters. “A” looks like a wobbly “w,” and arev is sun. The words are awkward in the ruled margins and my fingers cramp up when I trace their shapes over and over again. No amount of assignments will save my handwriting, I think. But I stay positive and transliterate the characters into my own phonetic system. “Farewell” sounds like cetaislusyun. It seems odd to learn such a heavy word as I’m just beginning, but Armenian is a language built on greetings — long goodbyes and warm hellos — and I feel powerless against the allure of each letter, forming a perfect shape alongside the next. Skype, I think. I wonder if I will be expected to speak Armenian during the tour. In any case, I flip open my notebook. I read the letters out loud and my mother tells me to stop chanting in Indian. I don’t bother to correct her. After all, Armenian may have started in a fertile valley between the Caucasus and the Euphrates, where the sun (arev, I remember) meets the water (jur), but now it is mine and I am determined to master it. Dear Karmun, if you haven’t already learned the word “abris,” look it up. I really enjoyed your writing. Thanks for sharing it with us. While many of the Armenians throughout the Diaspora are abandoning their language, it is heartwarming to see youngsters like you learning it. Soon, you can surprise the Armenians you meet on the streets of Melbourne by speaking in their mother tongue. Good luck to you. Karmun, this is such a fun and GREAT read – i’m so glad that you have written it. Stay hopeful! And keep practicing! You’re doing a wonderful thing! I’m an American(with no Armenian ancestry) who taught myself to speak Armenian. I had a “Rosetta” like CD Rom that would speak to me and display the English words and Armenian text. I had much difficulty with the Armenian alphabet. So I decide to transcribe the words phonetically in to English sounds. I wrote ever word in the CDROM program into an English sounding equivilant. I was doing this in preparation for a job in Nagarno Karabagh. Year one I had a translator. By the end of that year I had no need for him. I could not read signs( I was for the most part illiterate) but I could move freely speaking broken Eastern Armenian. Just thought I’d share my technique, maybe it can help in your studies. I am so happy for you! Feel free to contact me by email ([email protected]) if you would like to share more of your method. I do the same transliteration thing, which I will elaborate on in my next articles. Welcome to our Armenian-language family. Armenian alphabet has 36 letters. (English is only 26). So Armenian speakers can learn to speak most foreign languages with little difficulty. We are a little more than 6 million worldwide: about 12 million. Still, tiny compared to 1+ billion Chinese, or 1+ billion Indians, but we are working at it. I have been to Singapore: it’s a great city. And there is an Armenian Church, which the Government of Singapore considers a national heritage. Thank You people of Singapore. Best wishes for your Armenian language studies. Your comment was so nice to read 🙂 As for the six million, I got this number for figures of those who are speakers of Armenian, not just people of Armenian descent. As you know, there are many Armenians who no longer speak the language. Still they have played a very important part in many countries, including my homeland, and on behalf of Singaporeans I’d like to say thank you for your wonderful comments about our country. I read about your fascination for our language and culture. I wish you all the best to get straight A’s for your courses! You seem to be a determined polyglot! Good luck! Thank you very much Karmun. It is really to know non Armenian person trying to learn our native language. We do have rich history once you learn to can start read Armenian books, poems. I cannot wait to start reading books and poems! Thank you so much for the encouragement. I enjoy reading your articles. Your writing style is both fun and enlightening. The respect for the language and the culture that you convey in your fun and quirky way is refreshing and engaging. I know learning a language like Armenian can be a challenge at times, but it gets much easier once you get through the first initial hurdles. Keep up the good work. Singapore is one nation that is near and dear to my heart. In fact the national flower of Singapore is named after an ancestor of mine. She lived in Singapore in the late 19th century with her family, where they established a trading company. I learn something new every day! Vanda ‘Miss Joaquim’ (as we call her in Singapore) was an Armenian! Every schoolchild in Singapore learns her name at a young age 🙂 The orchid is my favorite flower and as a Singaporean I’m very proud of it. I am touched by all the help I have gotten from people after reading my articles. Thank you for the encouragement. Where your articles or books can be found? Your interest in learning Armenian is awesome and shows you have guts and don’t shy away from a challenge!!! I actually know Antoine who sent the previous comment as he lives in Ottawa, Canada! Small world!!! We Armenians have ways of finding each other!! I am trying to teach my daughter Western Armenian which is the dialect I was taught. BEST OF LUCK!!!! By learning Armenian without a family connection to the culture, you are joining a select club that counts Lord Byron among its members. Հաջողությու’ն քեզ: When you get a chance, go and visit Antoine in Yeghegnadzor. The town is centrally located within Armenia, and he is a well-connected, repatriated Canadian-Armenian involved in projects of social value. Lord Byron is one of my longtime idols. I thank you so much for comparing me to him, it is a great honor. I do hope that I will succeed, and that I will be able to visit Armenia soon – I have never been. Do read the rest of my articles if you have the time, and thanks again for your kind words. Karmun, you’re awesome for learning our language! I wish you the best of luck in all of your endeavors. Believe me, once you get better at it, you’re really going to enjoy speaking it. And I can speak for many, once we see someone, that’s non-Armenian who wants to learn, you will get the help you seek from them; it’s our pleasure and hospitality. Once, you begin to read some of the literature, and poetry, you will begin to under the soul, and entire ethos of our culture/language…good luck! Believe me, once you get better at it, you’re really going to enjoy speaking it. And I can speak for many, once we see a person, that’s non-Armenian who wants to learn, you will always get the help you seek from them; it’s our pleasure and hospitality. Once you begin to read some of the literature, and poetry, you will begin to understand the soul, and entire ethos of our culture/language…good luck!